After a woeful Valencia race (from pole to 9th and no points can only be considered a disaster!) I was five points adrift of Button as the game brought us to Spa, the famous venue of the Belgium Grand Prix. With six races remaining (including this one) I needed to reel Button in quickly. My concern was that Spa would not be my friend (on previous racing games, I have not raced especially well here). The practice sessions were actually quite good, with competitive lap times (including topping P2), and so I went into qualifying with a fair degree of confidence. Part of my pace here was, I suspect, due to an overly conservative AI braking harder at certain sections of the track. From turns 12-16, I was a lot quicker, as I was lighter on the brakes. This was also true of turns 8 and 9. 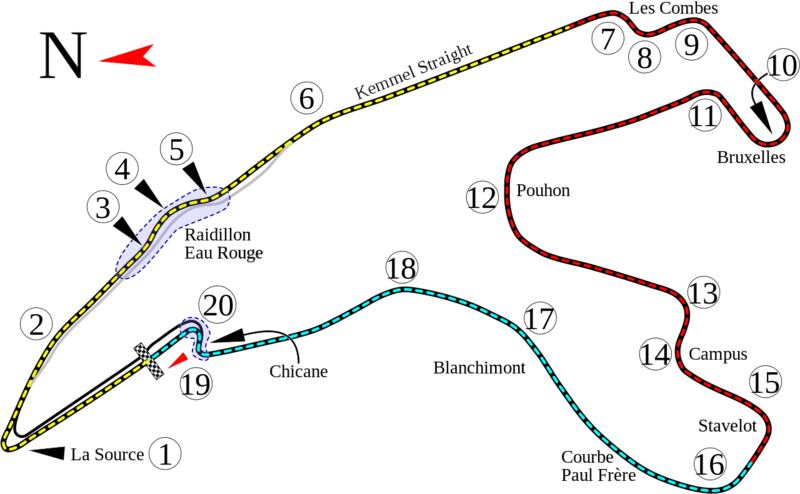 The famous Eau Rouge complex (a very fast uphill, curved section of track) was another area where I think I was faster. The result was that I breezed into Q3 (topping Q2 in the process), but then the weather (dry until this point) changed, forcing me onto intermediate tyres in damp conditions. My worst nightmare! As practice had been dry, I had no idea what to expect from a wet run! Fortunately, I was not only able to maintain my pace, but I pipped Brawn driver Barrichello to pole! At the very start of the race he nudged in front of me, but I dove down the inside of turn 1 (a formidable hairpin) and, with three of the four stints on soft tyres, I was able to race off into the distance. It was a trouble-free race, a good win, and I reduced Button’s lead back down to just one point, with five races to go!